This used to be the official website of Frankenspiel. The company that did have a project on Kickstarter for the funding of the FS-X bluetooth speaker. The speaker is still for pre-order on the creative-genius.com website. 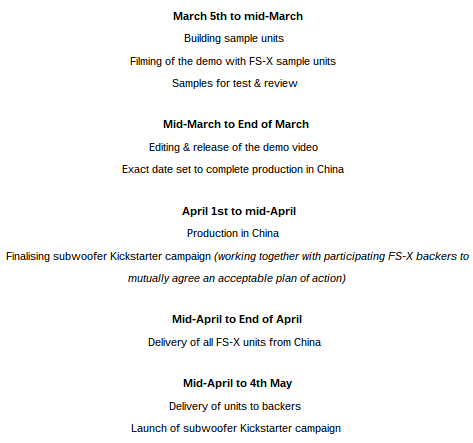 If you consider paying for a pre-sale speaker because it is promised it will be delivered soon keep in mind that Frankenspiel has a history of promising soon delivery, but at the moment hasn’t been able todeliver to the big majority of their kickstarter backers, who funded the project in May 2014. Some Frankenspiel updates on kickstarter. The FS-X is real. Please ask yourselves, “why else would we continue to share updates (totalling 115 today)?” If this was truly a scam, we would have disappeared to the fabled desert island, a long time ago. We have respecified components that gave us reliability problems, and have now redesigned our board. However, we have hit a delay with our manufacturer and we can’t get a firm date on when this component will be put into production – we’re doing everything we can to make this happen in early January. I know that many of you are disappointed that we have experienced significant delays with this project, and we are very sorry to have let you down. However, I want to reassure you that we are still working hard on bringing you outstanding speakers … We are now working as fast as we can to deliver all units by November 2016. We recognise that from an outsider’s point of view, our recent updates come across slightly mad. We appreciate that you may find what we are doing hard to understand, but there is method to our madness. Sadly we’ve got another slight delay, this time with our production partner. They are very busy in the run-up to Christmas, working with many other products of other manufacturers and have had to put our production back a few days … However, in brighter news, we have no more tech problems. Hooray! We’re pleased to give you a shipping date … Our production partner is now in a position to begin final assembly and does not expect any further hold ups. They will start shipping at the end of this month. We’re throwing you a party! To say thanks for all of your support over the last few months, we’re throwing you a party, here in London, UK to celebrate the success of the FS-X Kickstarter project.